On Sunday, if you were tuning into Twitter you might have noticed the TWTRCON tag trending. The tweets were from a business conference focused on Twitter. The speakers were a stellar list of celebrities in the Twiiterverse. The agenda covered a range of business topics. 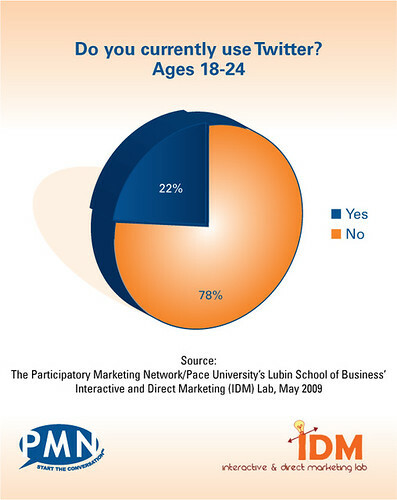 (I was supposed to attend, but real life got in the way, so I followed the Twitter Stream and picked up a few interesting tidbits like the study of Twitter and Gen Y illustrated above). The evening before was a benefit party for Operation Smile and the launch of their 140 Smiles Campaign. Chris Pirillo was there and at one point got up and offered to do silly stunts if we donated money to 140 Smiles. I kicked in $20 if he would sing if you're happy and you know it! (I have it on video). Here's a nice before the event write up from Jordan over at the Convio Blog based on a conversation with Renee Alexander, Operation Smile's Social Media Stragetist. I'll look forward to hearing a report. It's hard to get people's attention to talk about a charity at a cocktail party, especially in a dark, crowded, and noisey room. I noticed this during the launch of the Charity Smackdown at SXSW. So, if you're going the route of social media celebrities and party - might be hard to raise a large goal if you don't have a before/after online fundraiser. Some Twitter Tidbits plucked from the TWTRCON stream (and beyond). This dashboard that uses Twazzup was really useful because the raw #twtrcon stream was too much and no way to filter. The Twazzup interface seperated the speaker tweets. I ended up just following a handful of smart people who I knew were at the event. @shelisrael how to get past angst between personal versus organizational? #twtrcon it's all about trust isn't it? @JonBurg a twitter community is measured by the value delivered to the total of it's members. It's part quantitative, mostly qualitative. @billjohnston @shelisrael How do you "define" a twitter community? How many communities solely exist on twitter? @yvetteferry on measuring community: degree and quality of bilateral communication; loyalty; longevity; consistent engagement. To start. What Brands Want From A Twitter Client by Jeremiah Owyang. A great post that describes what his business clients want in terms of features. Right now, I'm using 4 or 5 different software clients because I can't find one that does it all. Twitter Business Use and Challenges, plus 5 Tips from TWTRON by Fredric Paul. As my children will verify, Twitter is for old folks. Twitter is a community building tool that allows its users to extend their far beyond just people that they know. Teenagers just don't do that. They don't really care about reaching out to people they don't know. They are not really interested in communicating in such an open way. They want person-to-person communication with people that they know or their friends. Let's remember we teach our kids to be wary of strangers. When I talked about twitter with my teenage daughters they said "but dad... some stranger could follow me, that's just gross".